This is the complete Illustrated Factory Parts List Manual from HARLEY DAVIDSON® for the SPORTSTER®. Years 1995 1996 1997 1998 1999 2000 2001 2002 2003. 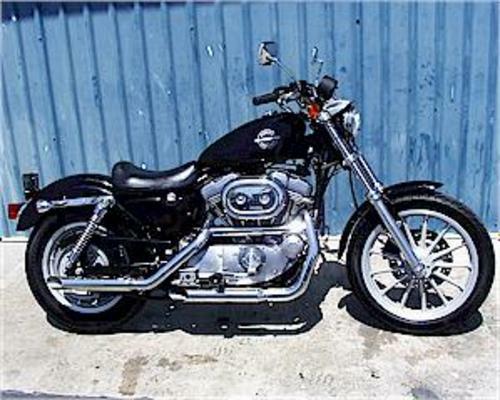 This parts catalog contains detailed parts explosions, and exploded views, breakdowns of all part numbers and parts catalog information for all aspects of the SPORTSTER®, including detailed engine parts breakdowns. For do it yourself vehicle parts lookup, parts book manuals are key to viewing how everything goes together. Believe it or not, parts list exploded views will also greatly assist you in servicing, rebuilding, teardowns, overhauls, repairs, and adjustments. Use the easy to read parts catalog exploded views to make easy part number identification, accurate ordering, and ultimately... correct repairs. This book contains all the original vehicle parts information you need to properly lookup correct part numbers for the entire vehicle including the engine parts. This is exactly like the original manual, or book made for this vehicle; the only difference is this one is not a paper book, and doesn't need to be shipped. You get it right away! Zoom it, print it, save it, close it. Print a few pages of the book at a time, as you need; no need to lug that bulky book binder around anymore; and definitely no time and fuel wasted chasing around town for out of stock paper parts list manuals. Once you buy this manual, you will immediately get a link in your email, then just go view it, print it, and save it to your computer for many more unlimited uses later on. All parts book manual sections are fully text searchable for lightning fast and simple one-click navigation, regardless of how many pages. This parts catalog is viewed using the latest, most popular state-of-the-art Adobe Acrobat viewer which most computers have already; to download the free viewer, go to https://www.tradebit.com. INSTANT DOWNLOAD means NO SHIPPING COST or WAITING FOR THE BOOK OR CD TO ARRIVE IN THE MAIL!